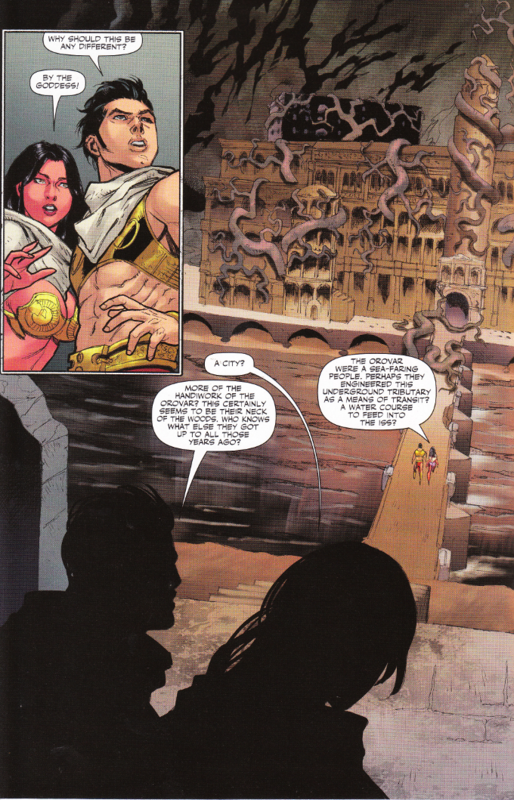 John Carter and Dejah Thoris have been trapped in the desert wastes for five days. Things look grim until they find an oasis... and barely survive a deadly encounter with a creature dwelling in the inviting waters. This leads them into an underground city... and a deadly secret that could lay waste to all of Barasoom! This story by Ron Marz and Ian Edginton proves exciting enough and worthy of the legacy of Edgar Rice Burroughs. I particularly like how realistic survival skills are depicted throughout the issue. Though I question the efficiency of bullets that explode upon being exposed to sunlight underwater, I'm willing to write that off as pulp science being pulp science and merely enjoy the fact that it is the scientist Dejah, not John the adventurer, who takes the lead in this adventure. Ariel Medel continues to deliver some impressive visuals. Of particular note is the two-page spread where we first see the vast underground city John and Dejah discover and we see their conversation unfold as they move through the great backdrop Medel has created. The colors by Nanjan Jamberi perfectly finish Medel's pencils and inks.